My husband recently woke up at the crack of 4:30am with me to attend a volunteer segment at my job. He whined and moaned, but all in all I was very appreciative of him going when he didn’t have to. Also, with sweetest day coming up (OCT 15th! ), I wanted to show my appreciation. I designed and made this card with 1 sheet of white cardstock, a couple bits found around the house. 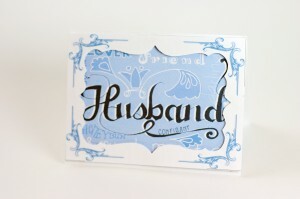 The “Husband” graphic was made from hand-drawn type that I scanned and colored. You can see the template here. Cut a sheet of white card stock in half, creating a 5.5 in x 8 in piece. Score and fold that piece down the middle, forming a 5.5 in x 4 in card. Using scrap cardboard or foam-core board, cut 8 quarter inch spacer squares. 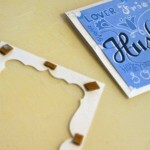 Glue these evenly spaced to the back of the frame piece. Let dry. Glue the Husband graphic onto the face of the card. Dab glue onto the spacer squares, and then position the frame piece on top of the Husband graphic on the face of the card. Voila! Write a sweet message on the inside! If you were able to save the inner portion of your frame piece from the template, you may flip it over (so the printed words and lines don’t show) and use chalk dust OR a paper towel dipped in just the tiniest about of stamp ink , OR a dry brush with a tiny bit of paint to color the edges of the shape. 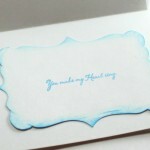 Stamp or write your desired message onto the shape, and glue it to the inside of the card.